This is an edited version of a story first published by Alternative Media Group in May 2014. Community groups campaigning against the WestConnex motorway complain that the WestConnex Delivery Authority (WDA) community feedback sessions for the motorway are a ‘useless sham’ and little more than a ‘tick and flick’ bureaucratic exercise. Two weeks ago, WDA announced that Cintra Hockey Park near Parramatta Road in Concord would be the mid tunnelling point for the extension of the M4 East extension from Homebush to Haberfield. If the plan was to go ahead, this would mean that residents living near Cintra Park would be exposed to drilling, vibration, dust for 24 hours a day while a massive amount of soil and rock is excavated from below. Hundreds of trucks a day would then transport this waste soil to Western Sydney along Parramatta Road. 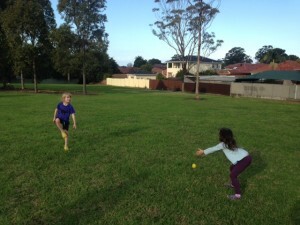 The decision was a shock to residents who've been kept in the dark about negotiations between WDA, Cintra Hockey Park and Canada Bay Council to move the Hockey Park onto public space in St Luke’s Park. After negotiating with both Canada Bay Council and the Briars Hockey Club for months, WDA presented the decision as a foregone conclusion despite no Environmental Impact Statement having been published for that section of the motorway project. There has also been no opportunity for other councils, community members and experts to present their views. Concord resident and Co-Convenor of the WestConnex Community Action Group Amanda Bull attended a WDA feedback session on Friday. Following the session, she described the process as “negligent” and a “useless sham”. Bull said that when she and other residents asked for details about the operation of the construction sites and the current planned route of the M4 extension, they always received one of two standard answers: either wait for the EIS or wait for the successful tenderer for the project to be announced. Bull described the information session as a “tick and flick” bureaucratic process that had no real meaning for residents who were being shut out from input into key elements of the WestConnex project and arguments about its merit. She said it was insulting that residents receive critical information only hours before media announcements of decisions. Some residents and City Hub‘s reporter who attended the session held well away from the park at Burwood RSL, had to present photo identification to even get past security and into the club. Others asked why the feedback session had not been held during a weekend on the park itself. They received no answers. Bull said that although there had been mention of the possibility of Concord park land being involved in the project, nothing at all had been heard about this from WDA since a large Concord community rally opposing the project had been held more than 12 months ago. It was reported that 280 residents cheered at the rally in January last year when Bull complained about the lack of consultation. It appears that WDA has followed the same method of decision making in Concord as the author revealed in her investigation of the St Peters Dial-A-Dump site late last year. In that case, WDA began secret negotiations to acquire the large highly polluted dump for a massive WestConnex interchange in St Peters about five months before the Federal and State governments' announced on Melbourne Cup Day that the interchange was planned. At the same time as the announcement was made, letters were being delivered to St Peters residents telling them that their homes were in danger of acquisition and demolition for the project. Asked to explain the secrecy of the negotiations in Concord, the WestConnex Communication Manager Ed Scully referred to the St Peters situation, saying this was a similar situation in which negotiations were conducted with a “commercial organisation and it would not be good practice to reveal to the suppliers and customers” that there was a possibility of acquisition. When asked to explain why the majority of submissions that raised concerns about the rationale for the project were brushed aside during the EIS process for the M4 Widening, he explained it was because the decision making was ‘issues based” and the extent of community opposition was not a deciding factor. Bull said it was “ludicrous” for the NSW Minister for Roads Duncan Gay to suggest that local roads would not be affected given the massive amount of spoil that would be removed by trucks from the Cintra Park site should it proceed. She and other residents are dismayed at the prospect of years of trucks, noise, pollution and vibration. She also says residents need to be aware that WDA's own traffic studies acknowledge that traffic will be worse on Parramatta Rd in 2023 if Westconnex goes ahead as some motorists are expected to shift their route to Parramatta Road in order to avoid the toll. WDA representatives present at the session were unable to give detailed answers to residents’ questions but took notes of some objections. Canada Bay and the Briars Club were both contacted for their views about the secrecy but had not responded at the time of publication. ( Canada Bay Council later sent a response which stated that Briars Club had been compulsorily acquired and that "the WestConnex Authority committed to undertaking full community consultation as part of this process. This has now commenced." Unfortunately this consultation appears to be taking place after the decision has been made. City Hub also attended a feedback session for the design of the King George’s Interchange on the M5 in Beverly Hills which is also part of the WestConnex project. This feedback session was held at Canterbury Council Chambers during working hours instead of in one of the small Beverly Hills parks that could soon be taken for construction work. Given the distant location and inconvenient timing, attendance was understandably low. Westconnex Action Group Beverly Hills convenor Kathy Calman rearranged her work schedule to make sure that her general opposition to WestConnex and detailed critique of the design were not missed. She later took City Hub on a tour of the area. The extent of the trees and other vegetation grown by residents which will be lost to widen the M5 soon became apparent. When the author asked about this at the feedback session but the issue was glossed over, although the designer admits that at least one home would be less that 10 metres from the Westconnex. One resident we spoke to didn’t know that works could soon begin very close to his house. Calman has received no response to her input into the design although this was the ostensible reason for the feedback sessions. When questioned at the Cintra Park information session about WDA's failure to respond to residents' concerns, WDA’s Ed Scully explained to residents that the WDA has been “given a remit to plan and execute” the motorway despite expected strong opposition from residents living along the route. But opponents of WestConnex claim that analysis by independent experts who say the project makes neither business or environmental sense are gaining acceptance. The project has already doubled in cost to more than $15 billion since it was first announced. Greens Newtown MP moves on Westconnex on her first day in parliament. Shortly after her election as MP for the new seat of Newtown, Jenny Leong said she would be campaigning against the Westconnex. So far she has delivered on that promise. 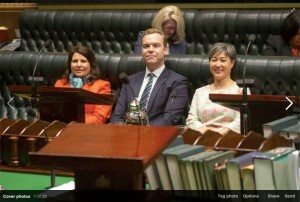 In her first week in NSW Parliament, she responded to concerns about WDA pushing ahead in secrecy and without an EIS by moving a motion that called on the NSW government “in the interests of good governance and financial accountability, to suspend all activity on the WestConnex project until the full business case and Environmental Impact Statement are made public”. The date for the motion debate has not been announced. In response to a question from Leong, the Minister for Transport and Infrastructure Andrew Constance said the business case minus the “non-commercial in confidence” parts would be released in July.